On the southwest side of the prestigious city of Lee’s Summit, Missouri you will find a remarkable community called The Crossing. Lee’s Summit, with its many noteworthy communities and subdivisions, is a popular choice for homebuyers looking to relocate in the Kansas City Metro area. The great amenities of Lee’s Summit, as well as its quick and convenient access to to the heart of Kansas City, are part of the reason Lee’s Summit made Money Magazine’s list of the “Top 100 Best Cities to Live in in the United States.” Buy a home in The Crossing community and you too can be minutes aways from all of Kansas City’s best dining, shopping, entertainment and recreation. The Crossing’s main entrance is found at 1250 SW Ward Road, in the 64081 zip code of Lee’s Summit, next to the Summit Crossing community. This family friendly community has an active HOA as well as its own Pool Association. The Crossing Pool is available to The Crossing Pool Association members for a nominal fee, the pool is located at 1029 SW Pacific Drive. 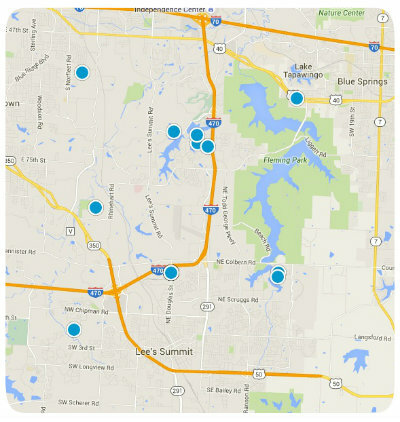 Students who reside in The Crossing neighborhood are served by the exceptional Lee’s Summit R7 School District. The Crossing neighborhood is a great place to buy a home for retirees, young professionals and families alike. This charming community affords its residents a quiet, small-town ambiance while being just minutes from all the exciting attractions of the big city. Homes for sale in The Crossing are primarily single family homes that vary in price depending upon the property's age, size, style, and special features. If you would like to buy a home in The Crossing community of Lee’s Summit, Missouri, please do not hesitate to contact us today for more information.